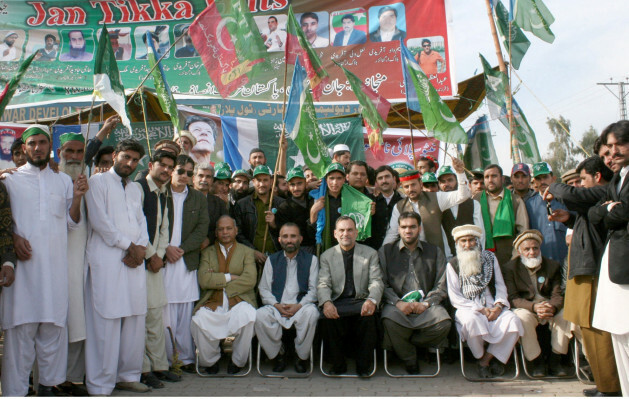 Local leaders at a protest camp against drones in Hayatabad town in Pakistan. Credit: Ashfaq Yusufzai/IPS. PESHAWAR, Pakistan, Dec 9 2013 (IPS) - More than 300 U.S. drone attacks have killed 2,160 militants and 67 civilians in Pakistan since 2008, according to Pakistani defence ministry data. But people living in the affected areas are now questioning these figures, asking why they never get to know the names of the militants or see the bodies. Residents of Pakistan’s Federally Administered Tribal Areas (FATA), which border Afghanistan and where most of the drone strikes have been carried out, say many more civilians may be dying in the attacks than officially revealed. “The attacks by U.S. drones are a complete mystery. No one is sure of the Taliban or Al-Qaeda casualties, but we know the names of the locals killed in these attacks,” says Sadiqullah Shah, a 51-year-old teacher in FATA’s North Waziristan Agency. The media issues such news without any proof. Neither journalists nor local people get to see the bodies of the terrorists. “Except for top names like Nek Muhammad Wazir, Baitullah Mehsud and Hakeemullah Mehsud, the local population has not got confirmation of the deaths of other Al-Qaeda or Taliban operatives,” Shah told IPS. After the Taliban government in Afghanistan fell in 2001, many of its operatives crossed over to Pakistan and set up bases in FATA’s Waziristan region. These very areas are now being targeted by U.S. drones in the hunt for terrorists. “There is no evidence that the drones are killing only militants, but we know of civilian families that have lost members in these air strikes,” Dr Sherin Mazari, information secretary of the Pakistan Tehreek Insaf (PTI) told IPS. Headed by former cricketer Imran Khan, PTI claims that more than 1,500 civilians have been killed by U.S. drones. The party, which leads the government in Khyber Pakhtunkhwa province, has blocked NATO supplies bound for Afghanistan through the province to protest against drone attacks. Mazari said the Pakistan government endorsed the American argument that the attacks were aimed at Al-Qaeda and Taliban members, but it was yet to reveal the names of the militants and civilians killed. FATA comes under the federal government, and is therefore required to publish the names of the victims, said Mazari, who is also a member of the National Assembly. Naming four victims of a U.S. drone attack in Hangu district of Khyber Pakhtunkhwa on Nov. 21, Dr Mazari said they were all students of a madrassa (Islamic seminary). The province is adjacent to FATA. Locals say missiles fired by pilot-less aircraft have imperiled their lives. Rafiq Rehman, a schoolteacher in North Waziristan, said in October last year his mother was killed in a drone attack while working in the fields. His daughter and son were injured. “I visited the U.S. and testified before a Congressional Committee about my mother’s death,” he said. In Pakistan, it is not uncommon for law enforcement agencies to show the bodies of criminals to the public, but that is not the case with militants said to have been killed by drones, say local people. After every drone strike, most media outlets run similar news. The media therefore issues such news without any proof. Neither journalists nor local people get to see the bodies of the terrorists, the reporter said. Adnan Khan, a 21-year-old Waziristan resident who is studying international relations at the University of Peshawar, said it was hard to tell who was attacking whom. Muhammad Sultan, a shopkeeper in Miramshah, said the local population was constantly afraid of coming under attack even as the drones had struck fear in the hearts of militants. “Militants keep changing their location due to the fear of drone strikes. Drones have killed those who were out of the Pakistan army’s reach in Waziristan,” he told IPS. The drones are believed to fly in from the Bagram Airbase in Afghanistan.